An enjoyable, interesting and relaxing tour starting with a visit to the capital city Valletta. You will first drive around the city where you will be able to see the fortifications and the way Valletta is magically lit at night. The coach will stop you at the Valletta Waterfront for a photo stop and you will then proceed to the Barracca Gardens for a breathtaking view of the Grand Harbour. You will then walk to the Malta 5D Show where you will discover the history of Malta in a different and enjoyable way. After the show, the coach will drive you to Mosta where you will see the Mosta Dome, the third largest unsupported dome in the whole world. The 18th century church became known throughout the country in 1942 when during World War II, a dropped bomb failed to explode thus sparing the lives of around 300 people. 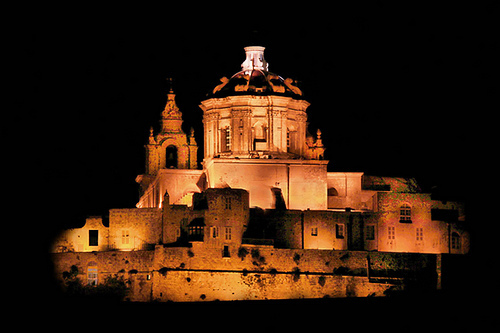 Finally you will visit Mdina, famous as the Silent City since it inspires tranquility at any time of the day especially during the night. The only way to explore Mdina is on foot. At Mdina, once the capital city of Malta, you will walk through the quaint alleys, narrow streets and you will also see the St. Paul's Cathedral beautifully lit. You will also see the view of the island from the high bastion walls. In Mdina you will have time for a drink or a coffee.